Russian Foreign Minister Sergey Lavrov during the meeting with the OSCE Special Representative and Coordinator for Combating Trafficking in Human Beings, Madina Jarbussynova. Moscow will actively support the work of OSCE Special Representative and Coordinator for Combating Trafficking in Human Beings, Madina Jarbussynova, Russian Foreign Minister, Sergey Lavrov, said at a meeting with the OSCE representative on Feb. 8. "You a doing very important humanitarian work, that is, the prevention of human trafficking in all aspects of this disgusting phenomenon," the minister said. "I am glad that you are paying your first visit to Russia." "I am glad to discuss the OSCE’s future steps. I know that your short-term plans include a conference of the OSCE Alliance against Trafficking in Children. We will actively support these and others endeavors," Lavrov noted. Index of fear: What are Russians most afraid of? Jabrussynova noted that she came to study Russia’s experience in this field and "establish dialogue with a view to eradicating trafficking in human beings." She voiced regret over the fact that "none of the 57 OSCE member-countries can say it has no problems in this regard, that safety of our countries’ citizens is ensured." "The number of (such) cases is growing indeed, especially now, amid the migrant crisis in Europe, taking into account the conflicts that take place inside and outside the OSCE member countries," she said. The OSCE envoy added that during her stay in Russia she will hold meetings at the Russian Interior Ministry, the Investigative Committee and meet with Civic Chamber members. "I hope my visit will contribute to strengthening dialogue and more active involvement of representatives of Russia’s government agencies and civil society to our common activities," she emphasized. 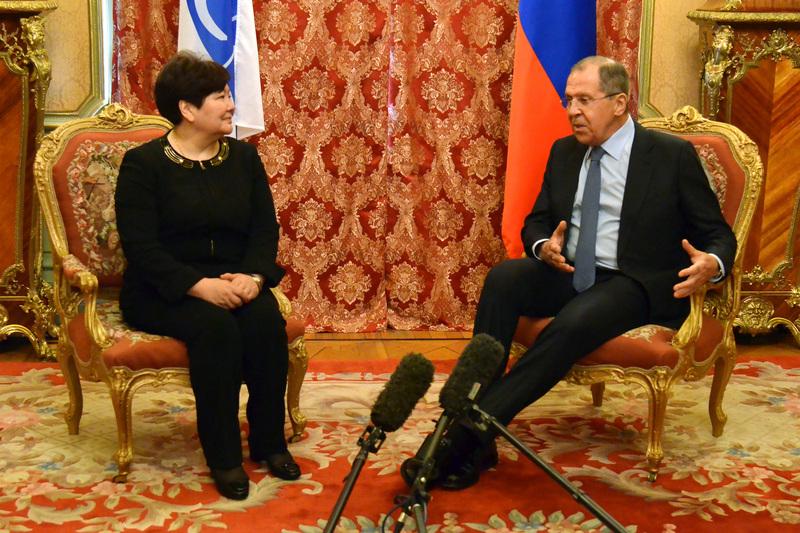 In response, Lavrov expressed confidence that this visit is very useful. "Certainly, we will feel the positive effects for Russia, for other OSCE member-countries and for the organization itself," the minister said.